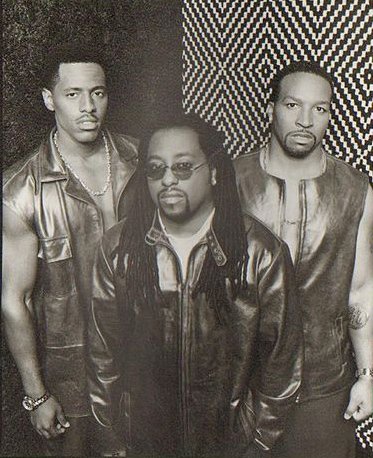 No U Aint Radio has learned about the recent passing of Jeff “Fuzzy” Young (pictured in the middle of the photo below), one of the founding group members of 90’s R&B Group Something For The People. At the time of this posting, it appears that Mr. Young died of an apparent heart attack after recently complaining of chest pains, but the family is still waiting on the official reports from the doctor. Our hearts and prayers go out to his family and friends during this difficult time. This entry was posted in Gossip and tagged curtis wilson, fuzzy, jeff young, My Love Is the Shhh, ro, rochad holiday, sauce, something for the people, You Want This Party Started. Bookmark the permalink. Fuzzy was a great fun and talented friend. I will miss his voice, conversation and spirit. I am totally saddened and shocked by Fuzzy’s passing. He was one guy that was ‘Always’ in good spirits and uplifting. He will truly be missed. The Bible speaks of this life as being ‘not the real life’ that God intended for us. Our life is so uncertain each and every day. Christ Jesus gave his life so that we could all regain the ‘real life’ in God’s paradise ‘EARTH’ once Satan’s world rulers have been eliminated. Dan 2:44 It then speaks of the ressurrection of those who have died in the past, back to life in a ‘New World society of people’ devoted to ‘Doing Jehovah God’s will’. I look forward to seeing not only both my parents, but other people and friends that have pasted. Learn the ‘truth’ about these things while there is still time. Jehovah has nothing but ‘good’ in store for those who love him and obey his will. Read Psalms chp 37. Till we meet again FUZZY WUZ..Fuzzy was always the same; he will be missed by MANY!! I loved the way he “MADE ” me in controll of “watching” his glasses while he performed. the amazing thing about the “WUZ” was that he was so HUMBLE while his talents truly were above what anyone around him even knew!! I always enjoyed his continuos “teasing”—him-(The WUZ) calling me Redwood (a joke about my long legs-gosh I feel like this is a dream). To the family, KNOW THAT THERE IS NO SORROW THAT GOD CANNOT HEAL. Fuzzy was a man of STANDARD, and he never changed who he was. He will truly be missed, and heaven has truly gained an ANGEL!! I shall not say rest….because now the ANGELS in HEAVEN have now gained a 1st TENOR in GODS’ ANGELIC CHOIR!!! SING ON SWEET SOLDIER…SING ON!! I have had the pleasure of knowing fuzzy for years. My appreciation for his gifts can not be even put in words. I use to call him for advice about the business as well as personal issues. This is most definitely a loss to me as well as other folks. Through the years we became brothers as well as friends. Even as I write dowm my feelings I am crying inside and out. Fuzzy you will be missed terribly. REST IN PURE PEACE MY BROTHER AND THROUGH GODS WILL WE WILL CONNECT AGAIN BUT ONLY THIS TIME ITS FOR AN EVER LASTING LIFE. Rest in Peace, Fuzzy!! Your legacy will live on through us, your friends and fans!!!! Love you!!! Spread your wings and fly over us!!! You will forever live within us!!!! Hi, i see that your page is very slow, it took around 9sec. Rest in heaven..I did not know this talented brother passed away..Thanks for leaving us good music to listen to.